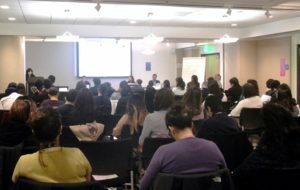 On February 17, 2017, we held our annual affiliate convening on “Surviving and Thriving in Our Post-Election World.” The event was co-hosted with the San Francisco Office of Civic Engagement and Immigrant Affairs (OCEIA) and Adrienne Pon, OCEIA Executive Director, served as the facilitator. Nearly 70 attendees, which included many of our affiliates’ Executive Directors, had the opportunity to hear from a panel of experts share about their perspectives on the challenges that lie ahead for the Asian and Pacific Islander community. They also presented strategies for how organizations, large and small, could address them at the federal, state and local levels. The goals of the convening were to: provide insights about the election, executive actions and future policies coming from our new administration; explore ways nonprofits serving the API community in the Bay Area can address the challenges ahead, both individually and collectively; and give participants an opportunity to connect and network. The response was an appreciation of the data and policy background provided during the presentations and the discussions that resulted from that.